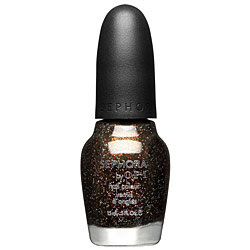 Deciding what nail polish to wear in Vegas was simple: Sephora by OPI's 212-SEPHORA is a party in a bottle. We started out using the dark nail polish on our toes only, but liked it so much we had our manicurist use it on our hands, too. We've been rocking the shade for a week now and have received compliments on the color from everyone from Vegas showgirls to the 50+ receptionist at our dentist's office. It gets our award for Best Black Polish 2009! This review was based on a free sample. This color looks amazing! Its nice to have a dark color that has a hint of sparkle. Advertorial: Get Extra Long Lashes!